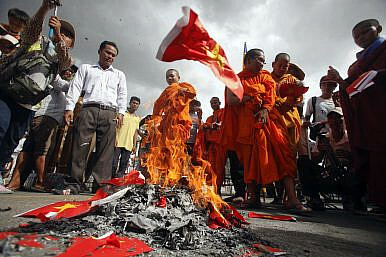 Buddhist monks burn Vietnamese flags made of paper as they protest near the Vietnamese embassy in Phnom Penh (October 8, 2014). Anti-Vietnamese sentiment dominates Cambodia, even among otherwise progressive NGOs and political groups. On June 21, 2015 a mixed contingent of soldiers and police descended upon Areyksat village in Kandal province to forcibly remove 55 houseboats and 10 houses on the river banks. Unlike other violent evictions — which are far from rare in Cambodia — the logic of removal was not to make way for development or infrastructure, but for “environmental reasons.” The people, all of whom happened to be ethnic Vietnamese, were purportedly “polluting the area” – which, according to local authorities, impacts on “local beauty” and “national and international tourism.” On one of the many pro Cambodian People’s Party (CPP) news channels that night, the news presenters gleefully presented the story, noting that “illegal immigrants have to respect the rule of law” and local authorities should be commended for “protecting the environment.” They even [incorrectly] added that a number of the evictees had been deported to Vietnam – to triumphant smiles. Two weeks later, this small Vietnamese community was pondering where to go when a large group of students — flanked by government officials — came to clean up the area, walking around picking up litter. They cited the need for “citizens” to protect and clean the environment. In a bizarre scene “student environmentalists” joined soldiers in “cleaning up” the local “environment” (which really equated to a straight out eviction), to the astonished stares of the recently evicted. The ruling Cambodian People’s Party (CPP) has drawn first blood in what promises to be an ugly and drawn-out election campaign after Prime Minister Hun Sen took an unusual step and enlisted the support of the senior military in a nasty crackdown on opposition dissent. Gen. Kun Kim demanded the removal of key opposition figure Kem Sokha from his parliamentary position, and got it after the politician’s wife was terrorized by 200 to 300 men on motorbikes throwing rocks at their family home in a well-documented, six-hour ordeal. The military intervention made unwanted headlines around the world. 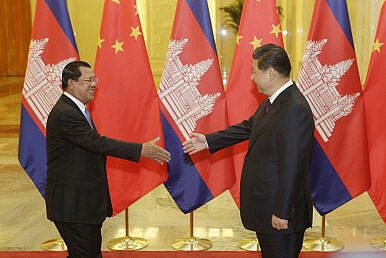 In China, Cambodia’s most generous benefactor, Xinhua was reporting a rise in political tensions, quoting Chheang Vannarith, Chairman of the Cambodian Institute for Strategic Studies, as saying the country was on the verge of a political crisis. After the Interior Ministry warned this week that it would not recognize the CNRP’s newly elected leaders because the opposition had violated its own bylaws in electing them, the party on Friday said it had asked the ministry to acknowledge its amended bylaws. In a hastily convened congress on March 2 to replace former party President Sam Rainsy — who resigned in February to protect the party from being outlawed under the new Law on Political Parties — the CNRP first changed the party’s bylaws, then went on to elevate Mr. Sokha to permanent president and Pol Ham, Mu Sochua and Eng Chhay Eang as deputies. However, the ruling party branded the bylaw alterations as illegal, stating that the CNRP should have first submitted its internal rule changes to the government before selecting new leadership, since the party’s old bylaws required a longer waiting period to change president. Mr. Chhay Eang said on Friday that the party had submitted the amended bylaws to the Interior Ministry on Thursday. “We are waiting for the official approval from the Ministry of Interior for recognition of Articles 45 and 47 of the party’s bylaw that we amended at the extraordinary congress in March,” he said. The dispute centers on the ministry’s claim that the CNRP violated its own bylaws when it selected new leaders at a snap congress earlier this month. At the congress, the opposition first amended its bylaws to change its process for selecting a new permanent president, then went on to elevate Kem Sokha to that role and elected three lawmakers as deputy presidents. Piling on yet another conviction to Sam Rainsy’s expanding criminal record, the Phnom Penh Municipal Court on Thursday found the former opposition leader guilty of defamation and incitement for claiming the state orchestrated last year’s murder of political analyst Kem Ley. “The court has decided to sentence Sam Rainsy…to one year and eight months in jail and fine him 10 million riel [about $2,500] on charges of public defamation and incitement causing turmoil in society,” Judge Y Thavrak announced in the morning. At Prime Minister Hun Sen’s request, Mr. Rainsy, who lives abroad and has been banned from returning to Cambodia, was also ordered to compensate the premier a symbolic 100 riel, or about $0.025. During the March 17 trial, Mr. Rainsy’s lawyer, Sam Sokong, argued that the comments in question were not directed at Mr. Hun Sen or anyone else in particular and so could not qualify as defamation. But Mr. Rainsy quickly sank his lawyer’s efforts by email, accusing Mr. Hun Sen himself of playing a role in the murder. Asked about the verdict, Mr. Rainsy compared it to the grenade attack on a protest he was leading in Phnom Penh 20 years ago. 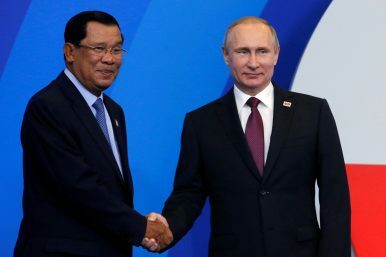 The attack killed 17 people and the assailants were never captured, though an unfinished FBI investigation strongly suggested the involvement of Mr. Hun Sen’s personal bodyguard unit. t had been almost two decades since the Khmer Rouge were ousted and forced to the fringes of the country, but their reaction to the FBI’s probe into a deadly grenade attack on an opposition rally in March 1997 had officials quaking at the U.S. Embassy in the heart of Phnom Penh. In a confidential cable to Washington on July 16, 1997, the embassy summarized a broadcast on Khmer Rouge radio months earlier that had coincided with other events to create a strong sense that the FBI agent leading the probe was at risk, prompting Ambassador Kenneth Quinn to send him on a “long weekend in Bangkok” on May 29. 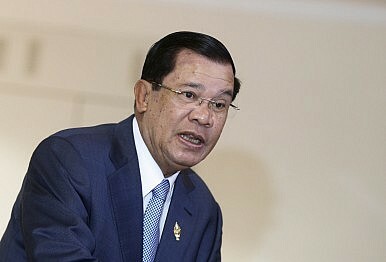 On May 25, the cable said, Khmer Rouge radio had “attacked the FBI in biting terms based on ‘reports from Phnom Penh,’ accusing the agents of consorting with Vietnamese prostitutes and licking the boots of Vietnamese puppets,” a reference to the CPP, which was believed by many to be responsible for the March 30 attack that killed 17 and injured about 150.